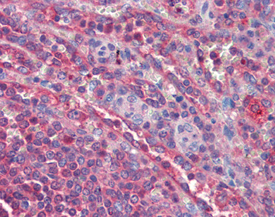 Immunogen: Synthetic peptide corresponding to a portion of human p38. The sequence is completely conserved in mouse. 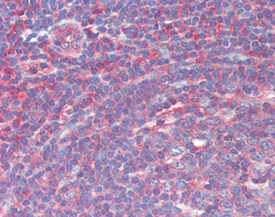 Scientific Background: Six proteins of the p38 subfamily of MAP kinases have been identified to date, including: p38alpha (SAPK2, CSBP) and its splice variant Mxi; p38beta and beta2; p38gamma (ERK6, SAPK3); and p38delta (SAPK4). p38 MAP kinases contain a conserved TGY motif in their activation loop and are activated in response to cytokines, hormones, GPCRs, and osmotic and heat shock to mediate primarily pro-apoptotic and pro-inflammatory responses. MKK3, MKK4, and MKK6 are known to activate p38 family members with varying specificity. All four p38 isoforms are able to phosphorylate the activating transcription factor 2 (ATF2), and differentially activate numerous substrates including Mnk1/2, Msk, phospholipase A2, and the MAPKAP kinase-2 and -3. Activated MAPKAP kinase-2 subsequently phosphorylates the heat shock protein Hsp27, an F-actin binding protein involved in cytoskeletal maintenance. Western Blot analysis of p38 MAPK: Lane 1: MW Marker, Lane 2: HeLa, (Cell Lysate) (Prod. No. ADI-LYC-HL100), Lane 3: Brain (mouse), (tissue extract) (Prod. No. ADI-LYT-MB100), Lane 4: Brain (rat), (tissue extract) (Prod. No. ADI-LYT-RB100). 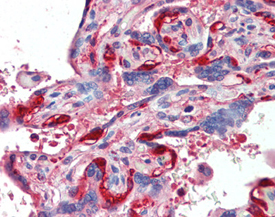 IHC Analysis: Human spleen tissue stained with p38 MAPK, pAb at 10µg/ml.